As some have already seen, the /about page on main has changed dramatically. It's fancy now with all the moving parts and visual examples, but there is one thing that feels kinda odd about it. The example currently given, as seen in the following screenshot, is a slightly modified version of this question. The /about section is intended to show new users what this site is about, and introduce them to the way the site works. Shouldn't we, then, encourage good answers with a good example, rather than bad ones? Why was this specific question chosen, or what makes a question eligible for being the example question on /about? Shall we replace the current example question, and with what other question? There are certain requirements for the question there, due to the space available and the need for at least two answers that will fit (one which must have a comment on it). Here are some eligible questions. Pick a better one! Keep in mind, the posts displayed on /about will be chosen to not have any lists, images, code, or headers. So if you pick a question that has one great (but long and detailed and heavily-formatted) answer and two short, crappy ones, the short ones will be the answers displayed. I realize this often is not an ideal way to show off the site's expertise and preferred style of answering, but it's currently necessary to avoid overwhelming the actual content of /about. Not the answer you're looking for? Browse other questions tagged discussion feature-request bug status-completed . Should an answer that is a link to the answerers personal blog be flagged as spam? What is the best way to ask for level of support for a new laptop model? 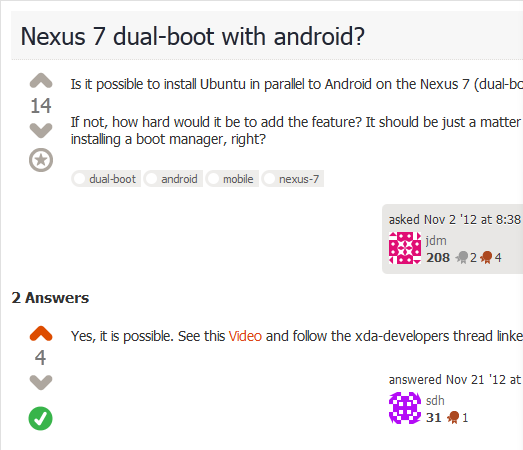 What to do With Question that involved a ubuntu wiki link? Can we improve the “better to include the essential parts” pro-forma comment?